To continue my foray into sensibleness I went to track on Monday evening. Actually I know that I tend to do better at track after a half as I dislike halves to such an extent that I feel I should erase it from my memory by getting a good track session in the bag. Of course I still thought the half might have taken it out of my legs a bit so was happy to discover I felt pretty good with no apparent half hangover. My plan as usual was to do what Paul was doing. In this case he was just doing the normal session with Caroline’s group. The session was 5 x (700t, 100j, 300f, 100j, 200f [2.5 minute rest]) I thought this might be beyond me and contemplated dropping back a group after the first rep but gave myself a stern talking to and resolved to keep with the group as much as I could. Thankfully I managed to hang off the back enough to warrant staying with the group and as usual the most ground was lost in the jog recovery sections where I always drop my speed much more significantly in comparison with everyone else. I need my recovery! 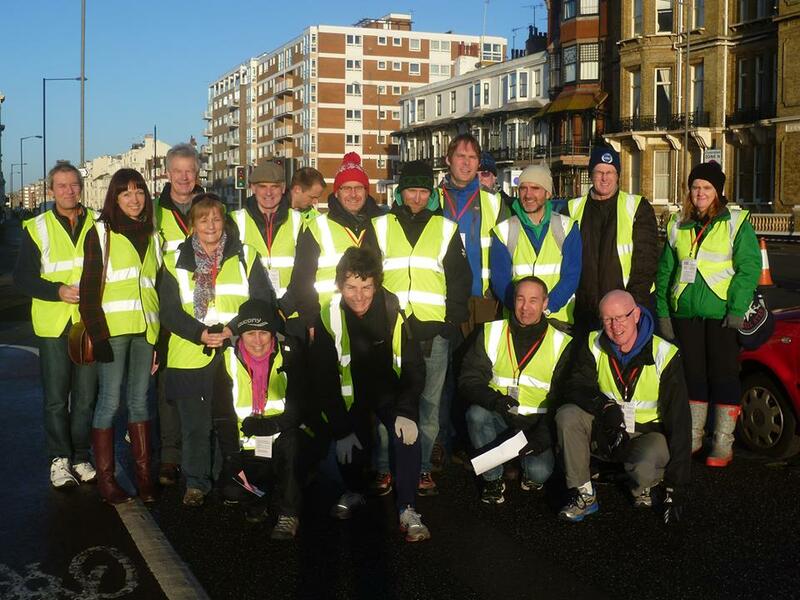 Luckily the 2.5 minute stationary rest at the end of each 1200 meant I could rejoin the group ready for the next. I was pleased with this session as I felt no ill effects from the half and managed to persuade my brain I could keep with the group. On Tuesday I went to Core & Stretch to try and stave off the inevitable muscle soreness of back to back half/track combination. I could certainly feel it in the standing series and especially balancing. Cramp ahoy! I battled onwards knowing it would be doing me good (somehow). The main area of total knackeredness was my hip flexors. This is usual and possibly due to the different-end-of-the-spectrum combination of long and slow and short and fast. I managed to continue my new found sense and didn’t go to spin or kettlebells in the evening. The advent of work has certainly helped curb my overtraining as Matt so rightly predicted. This must surely be a good thing. Wednesday was a full day of work which meant a full day of rest (except for the gentle, flat cycle to and from [which totals about 7 miles]). Thursday saw me struggle through a 12 mile lsr. The half/track combo had definitely caught up with me. I’m sure the run helped loosen off my legs a bit though and it gave me some more miles for the bank. On Saturday I felt like I could put in a good effort at parkrun. Having cycled over and done the world’s slowest warm up I felt that I was mistaken and was on for an exceedingly slow time, however once I got going I felt much better… for about a mile… when my lungs really began to tire and I slowed quite considerably. I carried on as best I could. The aim was to do all my miles under 7mm pace and I did just manage this so I shall have to count this run as a success even though I am still a little frustrated that I can’t get anywhere near the low 20s I was doing just before Christmas. I know it is due to my lungs’ massive tiredness/heaviness at the moment so once they revert to their usual (not great, but way better than this) state I should be able to drop pretty quickly back to the 20s as my legs still feel fine and I have been putting in the mental effort recently to a greater extent than I often do. I have also booked an appointment to get the sciatica that has been plaguing my left leg looked at so hopefully if I can improve that I shall be a step closer to getting back to some of the times I was running last year. The combination of tiredness, windiness and work means I have not gone running today. Another piece of sensibleness to add to my (small but growing) collection. 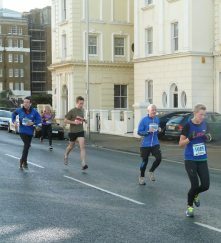 After the awfulness of Chichester I finally managed to put sense into practice and not run or do any exercise AT ALL (other than much unused-to standing up at work) all week knowing I had the Brighton Half to endure come Sunday. I did run Preston Park parkrun on Saturday just to remind my legs how to run as I always do better running the day before a race. I felt that I tried properly so was a little disappointed with 21.13 although it was rather windy. 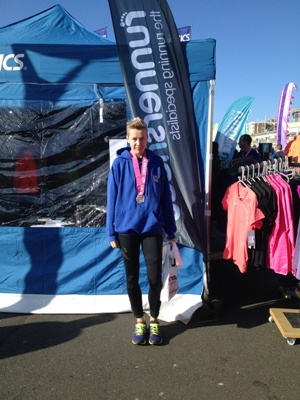 Anyway it didn’t really matter or concern me as the Brighton Half was my focus. Thankfully Sunday’s forecast was for perfect running conditions, sunny and not windy, which was amazing given the proliferation of gale force winds, rain, hail and general weather Armageddon we have been experiencing recently. After my awful run at Chichester last week I wasn’t expecting to break 1.45 but hoped I might be able to sneak under 1.40 if I was really lucky. As I really hadn’t been looking forward to this race after weeks of mojolessness, lung failure and general lack of motivation I had no pace band or any idea of what I was aiming to do. I knew the solid 6.52s necessary for sub 1.30 were out of the question but intended to go out hard as always and see what happened. This didn’t work due to the usual overcrowding and I discovered my first mile was a lowly 7.17. However as I had no idea what this meant finishing time wise I ploughed on. It seemed to me as the miles ticked on that I was on for quite a slow time as I seemed to be well over 7 minutes for each. As I reached 7 or so miles the inevitable conking out began to take effect. Luckily this coincided perfectly with the Arena marshalling section so their encouragement really helped me through this tough patch. As we turned back on to the prom for the final 4ish miles Duncan passed me so I tried to stick with him for a bit but was slowing and he began to draw away. Due to my inherent mathematical failings I was still convinced I was on for around 1.40+ but tried to buoy myself with the thought that once I finished I need never run a half again (how many times have I heard that before?). The last stretch seemed to be going on forever but then Kevin appeared next to me and asked if I wanted some company. Usually I would decline but today I decided to do the sensible thing as I knew he would help drag me through the last mile. He was so helpful, encouraging me onwards and telling me just to focus on running whilst he did all the talking. This was perfect and exactly what I needed so I can’t thank him enough. It was good to start overtaking a few of the hundreds of people who had been streaming past me from around 4 miles and I even pulled out a sort of sprint finish. I was very pleased and somewhat surprised to discover 1.36.55 on my watch. This was officially 1.36.46 chip time so much much better than I could have ever imagined. Only two minutes slower than Bexhill and I had really not trained as well and didn’t feel anywhere near as good as I had before that race. I’m sure the fact I actually rested for 5 whole days helped a lot so thanks to Rob for finally getting the message through to my brain that overtraining shall never help anyone (of course I know this but find it almost impossible to put into practice). Although an exceptionally low mileage week I was pleased with my race today and hope that this is the start of a new sensible me for 2014. Monday was track once more in the routine style. What wasn’t routine was I had to cycle there straight from work. Eek! Perhaps it served as a good warm up? It didn’t feel like it. Hot, sweaty and stressed. This meant I dropped out too soon in my first couple of reps with Paul but then I pulled myself together for the rest. This week Bob gave us the task of chasing down Dan’s group who were doing 1800s broken down into 600 sections. I accidentally (though unsurprisingly) went off like a loon on the first one as Bob said once we caught them we could stop. Alas this failed as even though I set off at a near sprint I still didn’t catch them and then totally died after about 200. Ooops. In a belated fit of sense I decided I would just stick with Paul for the next reps and this was much better though I still didn’t catch the group or keep with Paul the whole way. Although this wasn’t a wholly successful session I worked hard and managed to keep near enough to Paul for most of it. I then had the unparalleled joy of cycling up the giant hill from Withdean. All good strength training I’m sure. On Tuesday it was back to Core & Stretch to try and undo some of the battering I like to give my legs day in day out. I have discovered I can balance and plank quite well which I never used to be able to do so obviously the “core” aspect of the class has been having a good effect. I’m still very unstretchy but hey ho. Wednesday was time to brave the wind once again, this time for a LSR. I headed inland in a vain attempt to avoid the worst of the gales but it was still very windy and gusty. Also inland means hills. Though I hardly ever do hills these days so it can only be of benefit. I managed 13 miles and got home just before it started hammering it down so good timing (except I then had to go to Tesco so got soaked anyway). Friday meant spin. Somehow I managed not to get tired and noticed that other people were puffing greatly. Hmmmm, perhaps I wasn’t trying hard enough? Thankfully the class contained a lot of climbing which I much prefer to sprinting though my legs weren’t too happy with yet more battering. They should be used to it by now! 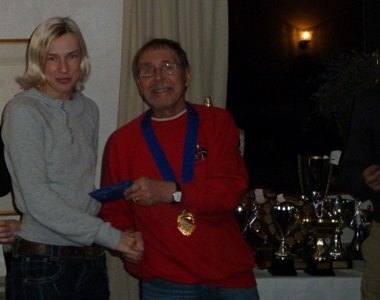 In the evening it was the Sussex Grand Prix Prize giving. I collected 4 prizes. 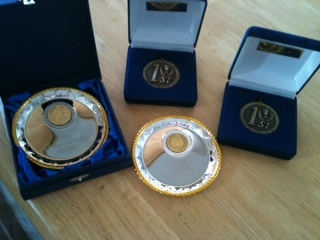 1st overall lady, 1st V1, 1st overall vet and 2nd Vet Team along with Anne and Jenny. Receiving the SGP 2013 Overall Ladies champion award. My overall haul for the evening. I gave parkrun a miss on Saturday as I knew I wouldn’t do well and it was still horrendously windy. This morning it was Chichester 10k. The forecast (unsurprisingly) was for very strong winds with gusts of up to 50mph. As this race is inland I hoped it wouldn’t be too bad. It was rather windy in places and seemed, as is always the way, to mainly be a headwind even though it is a lap course. As I am massively overtrained, overtired and mojoless with the lungs of an OAP I knew I wouldn’t be doing anything even vaguely decent today and lo I sulked home in an awful 44.24 (chip). 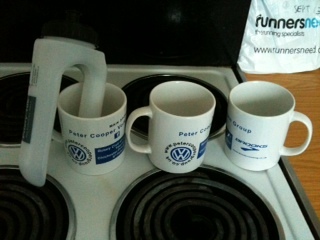 More mugs for the collection. Thanks to Rick and Ruth for their cast offs. I really need a rest from running and training to try and regain some mojo and motivation. Unfortunately I have the Brighton Half next Sunday but hopefully after that I can calm it down a bit and focus more on track. After last week’s success I hope Monday’s track session would be similarly good. This time Bob had devised a session where Paul and I would chase down the second group who were doing 1k reps. We would wait until they were mid way through then give them a 100m start before we had to attempt to close them down in 400m. This was an excellent and inspired idea. I managed to close down the group on a grand total of zero occasions though I nearly managed it once. Paul was only a little more successful. However we felt slightly better when Bob reminded us that the 1k group was running each rep 3 seconds faster than the previous one and that each time he was giving them slightly more of a lead. Also for the last two we only had 300 in which to close them down. I think we did around 6 of these. I really enjoyed the session even though I didn’t actually catch the group. It was good to have people to chase down. I know I worked hard as everything went green and the lines on the track had black counterparts which pulsed across my vision. The blinder the Isobel the harder she has worked. On Tuesday I had the usual Core & Stretch class but before that I had a free massage at my gym by someone who is in training so needed to get her practical hours up so it was free. She started off exceedingly gently but I told her I was used to being pummelled to within an inch of my life so she got a bit more firm but still nothing compared to what I am used to. It is probably good to have had a slightly more gentle one and she did some things that I haven’t had done before such as knuckling the soles of my feet. Yeech! After this I was prepared (as much as I ever can be) for Core & Stretch. Jenny took pity on Matt and I by doing slightly less downward dog than usual. We did however have to do some balancing instead and I was surprised to discover I could actually do it all with no wobbling or falling out. Mr A. Mazing. After this I set off to work – yes I now have a job. As Matt (gym instructor not fellow rubbish C&Ser) commented “that’s good. This work malarkey is really going to get in the way of your over-training!” In fact I could have gone to kettlebells in the evening as I was allowed to leave at 5 rather than 7 as stated on my roster but I thought I’d have the evening off as a special treat for finally getting a job. Wednesday was back to work so I didn’t do any exercise but I knew I had Thursday off so would stick a long run in then. Lo! I did. The forecast was for dry weather with no wind but cold. There was no wind but it was exceedingly wet, though not too cold. Once you are wet you are wet though so I ploughed on to make a good solid 13 miles. Another full day’s work on Friday so my second rest day of the week. Saturday rolled around again as it tends to do at this time of the week so off I set to Preston Park. I was hoping I wasn’t even slower than last week’s disastrous 22 minutes dead. I planned to try and follow Joe but this went out of the window immediately as he got subsumed by the speediest runners and disappeared. I implemented ad hoc plan B which was to follow Duncan instead. This was actually much more sensible anyway as he tends to run in the 20s which is where I am currently. I’m definitely not in 19.30 shape which is what Joe is running these days. Long story short I stuck with Duncan throughout (though I think he was surreptitiously slowing when I slowed to help me). I finished in 21 minutes flat this week so precisely one minute faster. The main thing being that I tried all the way around. I know that my lungs are still not completely right and I have a slight cold so I can’t expect to be running low 20s at the moment so I took the positive from concentrating and pushing throughout and hopefully soon this will translate into the times I feel I should be running at this stage (at least 20.10). Today I went out for an earlyish shortish long run as I had to get to work. Having been flayed by hail briefly around mile 3 the day then settled down to nice bright sunshine and rather warm. It was however quite windy in parts. I managed 11.5 miles which takes me to 32 for the week. Being on my feet all day at work and cycling more often too (commuting) is probably the cause of my achier than normal legs but I’m sure this will settle down once I’m used to it.